This article is about the five-element theory of Chinese philosophy. For other uses, see Wuxing (disambiguation). 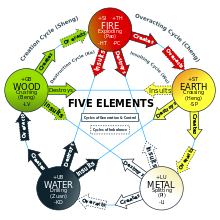 The Wu Xing (Chinese: 五行; pinyin: wǔxíng), also known as the Five Elements, Five Phases, the Five Agents, the Five Movements, Five Processes, the Five Steps/Stages and the Five Planets of significant gravity (Mars: 火, Mercury: 水, Jupiter: 木, Venus: 金, and Saturn: 土) is the short form of "Wǔ zhǒng liúxíng zhī qì" (五種流行之氣) or "the five types of chi dominating at different times". It is a fivefold conceptual scheme that many traditional Chinese fields used to explain a wide array of phenomena, from cosmic cycles to the interaction between internal organs, and from the succession of political regimes to the properties of medicinal drugs. 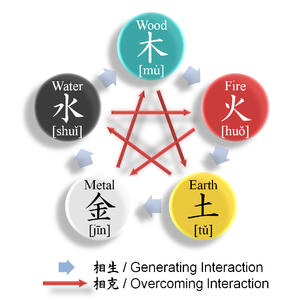 The "Five Phases" are Wood (木 mù), Fire (火 huǒ), Earth (土 tǔ), Metal (金 jīn), and Water (水 shuǐ). This order of presentation is known as the "mutual generation" (相生 xiāngshēng) sequence. In the order of "mutual overcoming" (相剋/相克 xiāngkè), they are Wood, Earth, Water, Fire, and Metal. The system of five phases was used for describing interactions and relationships between phenomena. 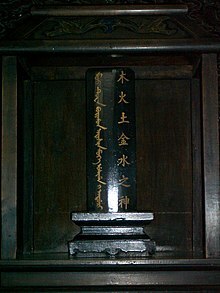 After it came to maturity in the second or first century BCE during the Han dynasty, this device was employed in many fields of early Chinese thought, including seemingly disparate fields such as geomancy or Feng shui, astrology, traditional Chinese medicine, music, military strategy, and martial arts. The system is still used as a reference in some forms of complementary and alternative medicine and martial arts. Xing (Chinese: 行) of 'Wu Xing' means moving; a planet is called a 'moving star' (Chinese: 行星) in Chinese. Wu Xing (Chinese: 五行) originally refers to the five major planets (Jupiter, Saturn, Mercury, Mars, Venus) that create five dimensions of earth life. "Wu Xing" is also widely translated as "Five Elements" and this is used extensively by many including practitioners of Five Element acupuncture. This translation arose by false analogy with the Western system of the four elements. Whereas the classical Greek elements were concerned with substances or natural qualities, the Chinese xíng are "primarily concerned with process and change," hence the common translation as "phases" or "agents". By the same token, Mù is thought of as "Tree" rather than "Wood". The word 'element' is thus used within the context of Chinese medicine with a different meaning to its usual meaning. It should be recognized that the word phase, although commonly preferred, is not perfect. Phase is a better translation for the five seasons (五運 Wǔ Yùn) mentioned below, and so agents or processes might be preferred for the primary term xíng. Manfred Porkert attempts to resolve this by using Evolutive Phase for 五行 Wǔ Xíng and Circuit Phase for 五運 Wǔ Yùn, but these terms are unwieldy. Some of the Mawangdui Silk Texts (no later than 168 BC) also present the Wu Xing as "five virtues" or types of activities. Within Chinese medicine texts the Wu Xing are also referred to as Wu Yun (Chinese: 五運; wǔ yùn) or a combination of the two characters (Wu Xing-Yun) these emphasise the correspondence of five elements to five 'seasons' (four seasons plus one). Another tradition refers to the Wǔ Xíng as Wǔ Dé (五德), the Five Virtues [zh]. According to Wu Xing theory, the structure of the cosmos mirrors the five phases. Each phase has a complex series of associations with different aspects of nature, as can be seen in the following table. In the ancient Chinese form of geomancy, known as Feng Shui, practitioners all based their art and system on the five phases (Wu Xing). All of these phases are represented within the trigrams. Associated with these phases are colors, seasons and shapes; all of which are interacting with each other. Based on a particular directional energy flow from one phase to the next, the interaction can be expansive, destructive, or exhaustive. A proper knowledge of each aspect of energy flow will enable the Feng Shui practitioner to apply certain cures or rearrangement of energy in a way they believe to be beneficial for the receiver of the Feng Shui Treatment. According to the Warring States period political philosopher Zou Yan 鄒衍 (c. 305–240 BCE), each of the five elements possesses a personified "virtue" (de 德), which indicates the foreordained destiny (yun 運) of a dynasty; accordingly, the cyclic succession of the elements also indicates dynastic transitions. Zou Yan claims that the Mandate of Heaven sanctions the legitimacy of a dynasty by sending self-manifesting auspicious signs in the ritual color (yellow, blue, white, red, and black) that matches the element of the new dynasty (Earth, Wood, Metal, Fire, and Water). From the Qin dynasty onward, most Chinese dynasties invoked the theory of the Five Elements to legitimize their reign. In Ziwei, neiyin (纳音) or the method of divination is the further classification of the Five Elements into 60 ming (命), or life orders, based on the ganzhi. Similar to the astrology zodiac, the ming is used by fortune-tellers to analyse a person's personality and future fate. In most modern music, various five note or seven note scales (e.g., the major scale) are defined by selecting five or seven frequencies from the set of twelve semi-tones in the Equal tempered tuning. The Chinese "lǜ" tuning is closest to the ancient Greek tuning of Pythagoras. Water Drilling 鑽 / 钻 Zuān Drilling forward horizontally like a geyser. Earth Crossing 橫 / 横 Héng Crossing across the line of attack while turning over. ^ Deng Yu; Zhu Shuanli; Xu Peng; Deng Hai (2000). "五行阴阳的特征与新英译" [Characteristics and a New English Translation of Wu Xing and Yin-Yang]. Chinese Journal of Integrative Medicine. 20 (12): 937. Archived from the original on 2015-07-16. ^ a b Chen, Yuan (2014). Legitimation Discourse and the Theory of the Five Elements in Imperial China. https://www.academia.edu/23276848/_Legitimation_Discourse_and_the_Theory_of_the_Five_Elements_in_Imperial_China._Journal_of_Song-Yuan_Studies_44_2014_325-364: Journal of Song-Yuan Studies. ^ "Traditional Chinese Medicine: In Depth". National Center for Complementary and Integrative Health. Archived from the original on 4 April 2017. Retrieved 20 March 2017. ^ Hafner, Christopher. "The TCM Organ Systems (Zang Fu)". University of Minnesota. Archived from the original on 6 April 2017. Retrieved 5 April 2017. ^ Eberhard, Wolfram (December 1965). "Chinese Regional Stereotypes". Asian Survey. University of California Press. 5 (12): 596–608. doi:10.2307/2642652. JSTOR 2642652. Wikimedia Commons has media related to Wu Xing.